Solid State Solutions (S3) was formed in 1988 as a Value Added Integrator of Data Storage and Storage Management Systems. Since then they have developed and evolved during a period of accelerated technological advancement to become specialists in identifying and providing bespoke data storage solutions across rapidly changing business landscapes. Clients of S3 are diverse and range from SME’s to Blue Chip companies. In 2015 S3 were acquired by Capita PLC. 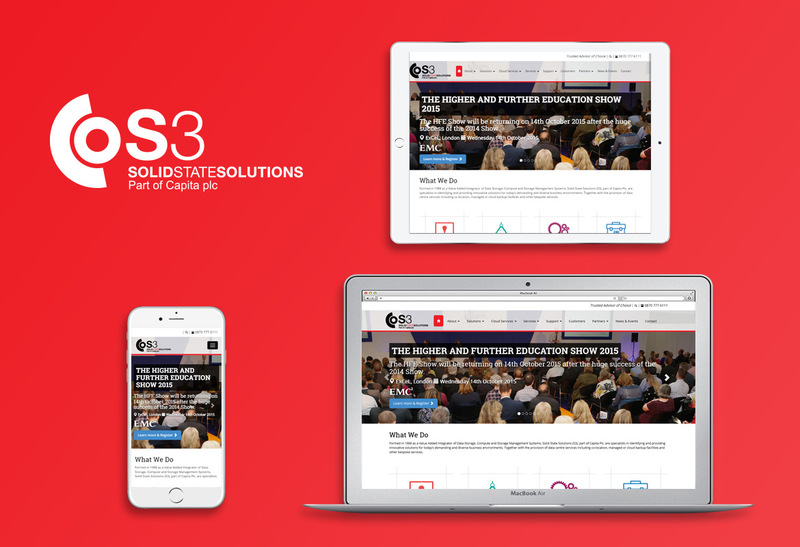 WebPraxis has developed a relationship with S3 over a number of years, in which time our expertise has been central to their online and offline re-launch and the development of their new website which remains at the core of their event driven marketing strategy. Annual industry leading events hosted by S3 attract leading figures from the world of Data storage. Experts from Symantec, Commvault, Isilon and Vmware have all attended, however while high profile attendees generate interest, S3’s online and offline presence is just as critical if not more so to its ability to generate customers through the promise of an unparalleled service. It was the creation of this pledge that WebPraxis was tasked with delivering through its web and offline branding for S3. A new website was constructed to allow S3 to break with the past but retain its identity as reliable storage-centric provider who place the specific needs of their customers above all others. In addition to building a new website, WebPraxis’ re-brand of S3 extended to new company logo’s, print adverts, marketing packs and all offline literature. Online page design and copy was optimised to reinforce S3’s visual metamorphosis and corporate image. With the marketing process in the build up to events lasting upwards of three months, WebPraxis has integrated sophisticated e-marketing, optimised landing pages and ongoing marketing reports into the S3 business management processes. With ongoing evolving support WebPraxis has contributed to S3’s top line growth of over 60% in the last three years. That fact that this has been achieved in the economic downturn is even more remarkable but is perhaps indicative of the quality of S3’s online presence and their new ability to base and revise their marketing strategy through accurate and refined data.